For volume 2003-1 and older volumes there are abstracts available at the bottom of this page. In a few decades, a former marshy island inhabited with fishermen grew into one of the most important economic centres in Asia. It is clear at first sight that this modern metropolis is amazingly well organized and clean, which is unusual for this part of the world. The locals, mainly Chinese people, have a decent standard of living and solid social security. Times ago, Singapore was famous as a shopping paradise. The offer is still at a remarkable level there, though the prices are no longer so very favourable. But they are still low enough, so that great numbers of foreigners are attracted by innumerable shops every year. Corsica is a mountainous island in the Mediterranean belonging to France. It is a popular holiday destination offering mountaineering, hill walking, sunbathing on its many beaches and water sports. Its strategic position in the centre of the ancient world attracted numerous foreign conquerors. This has made the Corsicans a proud people who still yearn for independence. The climatic characteristics of a region can be indirectly established by observing the vegetation. One of the methods is to observe the phenological stage of budding of a certain plant species on different heights above sea level. The article presents the development of phenological stages of budding of beech and vine, the sort of Welsh Riesling (Vitis vinifera cv. laški rizling), on the south slopes of the Boč mountain. Determined were measuring posts where the development of buds was regularly observed and, concurrently, air temperature was also measured and weather characteristics recorded. By considering the features of landforms, the development of buds was compared to the temperature curve and their correlation was thus established. Although karst researches in China are carried out separately from the karst-sciences of western countries, terms such as fengcong, fenglin and shilin are enforcing gradually into international and Slovene karst terminology. Instead of cone and tower karst Chinese karstologists distinguish two types of tower karst: fengcong and fenglin. Shilin is a type of the subjacent karst. Karren have been transformed into the high pillars and reshaped by rain corrosion. Among them there are deep vertical fractures and trenches. The history of the spice island, the island of white sandy palm-fringed beaches lapped by the warm turquoise waters and pristine coral reefs, was written by the monsoon winds that blow from December to February from the northeast over the Indian Ocean. These winds encouraged Indians, Arabs, and Persians to direct their dhows toward eastern Africa. The unique image of Zanzibar, a key port on the thriving Indian Ocean trade routes, was shaped by the people who sought to control the trade. The Great Lakes in North America rank among the most famous lakes on our planet. One of the most important industrial and urban areas developed precisely around the Great Lakes, to which a famous waterway, the St. Lawrence River, leads. The rapid development, particularly after World War II, was also accompanied by environmental problems; they have mainly been solved now, so that the water in the Lakes is chemically rather clean; however, the preservation of the autochthonous fauna and flora in the Lakes still remains a major problem yet unsolved. The article deals with some of the most famous natural monuments in Southeast Utah and its direct vicinity, such as canyon-lands, natural arches, natural bridges, and results of erosion and solution, such as mesas and buttes. Some of these landscapes, for example the Monument Valley, have been host areas for moviemakers for several times. The Colorado plateau abounds in volcanic phenomena, too, such as isolated volcanic necks. Mentioned are also the traces of an old civilization of the Anasazi Indians, their culture and settlements. In the faces of Kraški rob many landforms occur which are mainly typical of karst caves, bare karst and non-karstic faces. Described are some less known landforms, such as calcite-sedimentation results, i.e., ribs, needle-like speleothems and clod formations, and solution results, i.e. rainpits (floor pits), biopits, eyes and subsoil tubes. Their appearance, size, occurrence area and frequency are described and some hypotheses on their origin are presented. The paper deals with 15 water sources that are regionally important for water supply in Zasavje region. The main objectives of the investigation, carried out within the framework of Protection of Geographical Environment studies, were to establish the actual situation of water protection areas in five municipalities of Zasavje region and to make a general assessment of their pollution. Despite strict protection measures, including bans on certain activities, a lot of these were discovered to be spreading even into the inner zones of water protection areas. The author describes the Utah part of the Colorado plateau which is intensely dissected by a branched river system of the Colorado, its central section and the upper reaches in particular, and two of its tributaries, the Green River and the San Juan. The area is geologically rather evenly composed of 2400 meters thick Cambrium to Tertiary sediment layer which is dissected by numerous rivers to different depths, most deeply in the Great Colorado Canyon. Therefore, it is unique for the study of its extremely long-lasting geological as well as geomorphological developments, and in addition it abounds in numerous specific landforms and natural monuments. Drought is a recurrent natural disaster in Prekmurje which affects the region every few years. The article describes the drought of 2000. Its causes are presented by means of climatic indicators. The long-lasting meteorological drought resulted in hydrological drought and, consequently, due to the existing geological and soil conditions, in agrarian drought. Possible solutions to the problem are indicated, from irrigation to proper selection of croppers. The pedogeographical package for soil investigation is presented in the paper. The package includes digital images (photos), different soil data in the table form and in graphical representation, computer procedures for performing laboratory measurements and calculations and graphical presentation of soil profiles with included analysis data. The package brings the necessary support for field and laboratory study of the soil characteristics and serves as a tool for the interpretation of analysis results. It could be used in research work and for teaching as well. The Portuguese island of Madeira lies in the Atlantic, a few hundred kilometres north of the Canarian Islands which are much more famous and better developed as regards tourism. It is an island of volcanic origin, having a mild ocean climate. The north side of the island receives quite abundant precipitation in winter months, so that water has never been a problem to the islanders. In the past, its development was based on agriculture, while in recent times the importance of tourism has been constantly growing, though, due to its steep coast, the island lacks proper possibilities for mass tourism. Visitors to Madeira are mainly the people who love nature and walking. Initially, the article deals with the unique geographical position of the town and continues with some of its unique social geographical characteristics. Unusual mixture of the population is presented as a result of the specific history. 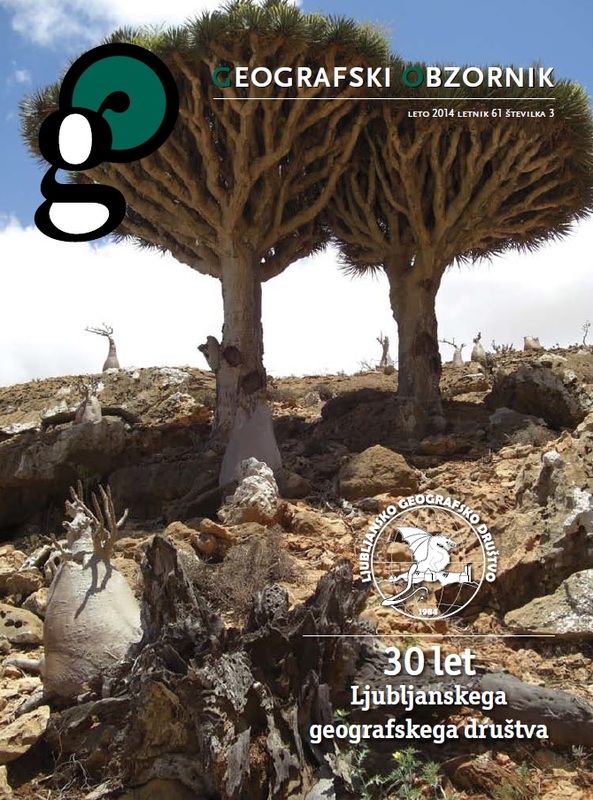 At the end the article deals with some peculiarities of Table Mountain and Cape of Good Hope. The Upper Soča valley is one of the most threatened parts of Slovenia regarding rock-falls, slides and flows. 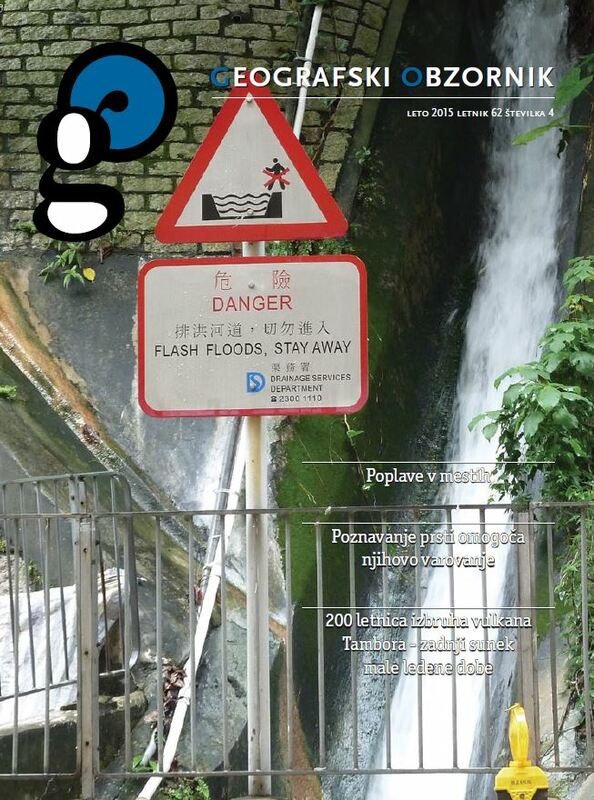 In this article some main characteristics and consequences of rock-falls triggered by the earthquake of 12th April 1998 are presented as well as those of the debris flow in Log pod Mangartom, November 2000, triggered by intensive precipitation. Argentina is a country where the large majority of population is white. This is the consequence of its history after the arrival of the Europeans. Despite this rather numerous Indian population remained and it retained at least part of its culture. In the last years it is increasingly appearing in the public with its demands, is getting organized and trying to acquire the rights, which are, at least partially, already included in the legislation. The results of specific natural conditions in Namibia are obvious in its extremely sparse settling and its economic orientation into mining, fishing and extensive agriculture. The droughty conditions gave rise to the development of very interesting wildlife and vegetation. Because of the growth of certain economic branches that interfere with the natural conditions, certain dangers have occurred that can pose a threat to the natural balance in this south-African country. In spite of unfavourable conditions for life, the Kornati Islands, an archipelago consisting of numerous small isles that are strongly exposed to karstification, were used especially for pastures and partly for fields already in the past. However, in more recent times, tourism has also been gaining in importance, the nautic tourism in particular. Only in 1980, when a part of the Kornati Islands, i.e. the outer, most attractive section of the archipelago, was declared National Park, the criteria were established that enable the protection both of the seascape and the landscape. The article deals mostly with socio-geographical characteristics of Sydney: its unique geographical position on either side of Port Jackson Bay, domestic and international importance, economy, population, structure and physiognomy of the town. At the end, some more attention is dedicated to the City of Sidney with its peculiar structure of residents and labour. This paper presents an analysis of the Beskydy region as a frontier area and focuses on the current state as well as on the developments in the field of tourism. The paper also reflects functional utilization and provision of service infrastructure in the region. Furthermore, the paper outlines necessary developments of already existing resort areas and centres in the Beskydy euroregion and deals with prospects and priorities in the development of tourism, of holiday activities and infrastructure that are based on the evaluation of the field survey. The paper presents the features of salty soils and their origin. It is erroneous to believe that salty soils occur only in the areas with arid climate. They can also be found in Slovenia and the neighbouring countries, Austria and Hungary. The proximity of a sea, low precipitation and high evapotranspiration, specific parent material, and interventions into water regime also contribute, besides insufficient precipitation and high evapotranspiration, to the origin of salty soils in sub-tropic areas. Because the areas of salty soils are spreading, it is reasonable to raise a question, whether salty soils represent an environmental problem or they are, due to their typical features, important growing areas for halophytes. The article is a summary of the part of the graduation thesis entitled The heat island of Ptuj. The differences in temperature between the city and the surroundings can be observed as the heat island, because the city is warmer than surroundings. The intensity and the shape of the heat island change during the day; they depend also on the weather types. The heat island is the most expressive in the old city centre, where density of buildings is the highest within the town. After the collapse of the Austro-Hungarian monarchy, the Carinthian plebiscite of 1920 established Carinthian Slovenians as a national minority. Their rights were only determined after the 2nd World War by ratifying the Paragraph 7 of the Austrian State Treaty. In spite of this the Slovenian public, as well as the Slovenian and Austrian state policies, often disregard the national minority rights. The Carinthian Slovenians have secured their existence and development by maintaining their original culture and identity which will be passed on to new generations with new knowledge and old family traditions. 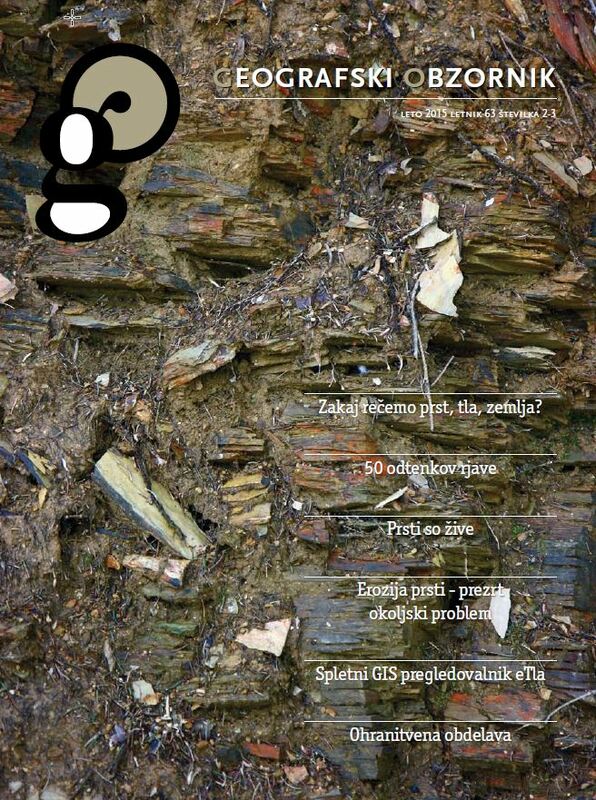 The paper first discusses the question of expert literature which should be used in preparing a geography textbook. Probably, no literature exists at all, which could illuminate this problem from all possible aspects. Two stages can be discerned in the process of preparing a geography textbook. A comparison is made between the making of a movie and the writing of a textbook; textbook authors have the role of screenplay writers, and editors that of directors. Some of human geographical features of Haiti are presented. A special emphasis is laid on poverty, racial, linguistic and religious structure of the population. Also a short history of Haiti is briefly presented. There are 359 illegal dumps in the Ljubljansko Polje area. The data is taken from the cadaster of illegal dumps and refers to March 2000. These dumps emerged owing to the main location conditions (transport accessibility, proximity of settlements, hidden location), improper organisation of waste collection and poor environmental awareness. There is a ban on waste dumping in the major part of the Ljubljansko Polje. In spite of this, the number of dumps and the amount of wastes heavily increased in comparison with the year 1996. These dumps represent a constant threat of groundwater pollution in the Ljubljansko Polje. The article is summarising the conclusions of the research which was made by a group of geography students. The main goal of our study was to define quality of environment in the urban area of Ljubljana. The first part represents functional evaluation of geographical features. In the second part we focused on collecting data about environmental pollution and the conditions of the main elements of urban ecosystem. The article deals with an increasing need for young people of Europe to receive education designed to develop a European awareness which is essential to the building of a new Europe and cannot be achieved without a profound commitment by all those involved in the educational process, a unified effort and co-ordinated action. Geography teaching should give young people enough information and understanding of contemporary problems, it should develop pupils' and students' autonomy and stimulate tolerance, group work, creativity, intellectual curiosity together with responsibility for European culture and natural heritage. Malta, a southern part of Europe closely related to Africa, has been, due to its important position in the midst of the Mediterranean, exposed to most diverse influences for millennia. The traces of the past were left on these islands by Phoenicians, Carthaginians, Romans and Arabs, and in the 20th century, even by French and British people. The famous past, hot sun and rather clean sea touching the land on steep and agitated shores are the riches of Malta which attract numerous tourist. Bangalore, the capital of Indian state Karnataka is experiencing in the last few years a quick development, which is mainly result of Information Technology Policy that was announced in the year 1997. In spite of this development, Bangalore remains typical Indian city with increasing differences between wealthy and poor people. A prevailingly desert country, Jordan symbolizes political stability among the countries of the Near East, representing an ideal example of transition from the traditional to contemporary way of life. On its territory, some mighty civilizations developed in the past that controlled not only the Jordan area but much larger areas and left deep traces in it. In the future, the country will further develop its tourism, for which there are sufficient bases there, so from the cultural-historical as the natural aspects. Even by now, the number of tourists from various parts of the world has been increasing from year to year. Virštanj lies in the vinicultural region of Podravje. It ranks among to very favourable areas for the production of quality wines and has over 80 % of first-class vineyard positions. The spread of vineyards is influenced by the relative altitude, since they are limited to the thermal belt. The spread of vineyards is also conditioned by minimum temperatures and their related negative weather phenomena (frost, fog). In the cadastral commune of Virštanj the total area of vineyards radically decreased in the period between 1824 and 1998 because of the wine fretter and the abandoning of agrarian activities. 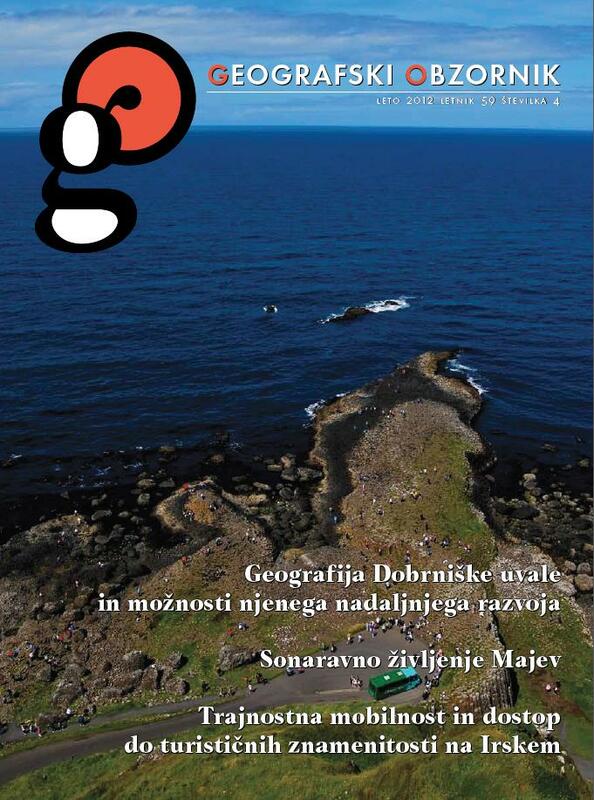 In the article 34 geography textbooks from 34 different European countries are compared. We limited ourselves on the outer structure of textbooks. Although there is no unified school of writing geography textbooks, we have perceived the outlines of some models of creating the textbooks: English, French, Italian, German, Scandinavian, Eastern European, Balkan and Baltic. In some European textbooks we can find the solutions unknown in Slovene textbooks. On the other hand in some European textbooks some elements are missing which seem to be indispensable in Slovenia. Some of Sarawak's basic geographical features are presented, such as the geographical position, landforms, climate, vegetation, population and economy. A special emphasis is laid on the tropical rainforest and the ethnic diversity of Sarawak. Several karst areas of about 30.000 sq km in total stretch along the entire west coast of Madagascar. Even though some of these areas are very interesting they are only poorly investigated. Tsingy, one of the most spectacular karst forms, are a kind of mega-runnels. They consist of rock columns and rock dents, which are separated by narrow or broader fissures and ditches. The highest columns in the discussed karst massif of Bemaraha are up to 50 meters high. Due to its position in the midst of South America and the numerous military dictatorships of the past few centuries, the country has been rather isolated ever since. At the time of the Spanish conquest, the territory of present Paraguay was populated with nomadic Indiands, the Guarani, only. There are only about 3 % of the Guarani in the population structure now. A special language that has survived among mestizzos has the importance nearly equal to that of Spanish. The economy is based primarily on agriculture; political and economic power has already long been in the hands of a small elite group of rich land owners. The division of Moravče Municipality to smaller homogeneous regions was made within the frame of The Project of an Overall Development of Rural Areas and the Revitalization of Villages. It provides easier evaluation of land for various types of land use. The division is based on the geographical analyses of the most important natural and some social landscape elements. Moravče Municipality extends over two main mesoregions: lowlands and highlands. The paper is a summary of the graduation thesis entitled "The Socio-geographic Characteristics of Student Tourist Travels". The first section describes the purpose and objectives of the thesis, its bases and the methodologies applied. The second section is divided into two subsections of which the first one deals with characteristics of a selected population of students, whereas the second subsection presents the results of the author's own research. The last section discusses the development and the current state of the youth tourism in Slovenia. Changes in Slovenian macroregions are described, as they are anticipated due to the influence of climatic changes. The scientists have established that the average yearly air temperatures in Slovenia have increased in the last decades, while the precipitation amount has not changed significantly. Warming up is anticipated in the 21st century, while the forectasts made for precipitation have proved to be less reliable. Climatic changes will strongly influence the life. The effects of climatic changes will vary from one Slovenian macroregion to another and they will be positive as well as negative. Pantanal is a landscape of extremes. Through the year rainy season and dry season alternate. For savannah water is of a vital importance. A large density of a river system assures somewhere a periodical and somewhere a permanent flooded land. Pantanal is one of the areas with the highest biotic diversity in the world. Due to beneficial conditions (i.e. Mediterranean climate, low prices, charter flights, interesting landscape, influence of fashion etc.) Balearic Islands represent a test case of mass charter tourism. Only several regions (mountainous edge, central part) are “unspoiled” in tourist sense. The third part represent very expensive and exclusive places occupied by international jet set. Article focuses on factors which have influenced the development of tourism, and on different positive and negative effects of tourism on Mallorca. Jamaica is one of the Caribbean islands with a particularly stirring history. Columbus made just a short stay on the island but in later centuries it became a resort of pirates who, with a silent British consent, robbed the wealthy laden ships. The island remained under British authority until the attainment of independence. Today the only reminiscence of the onetime colonisers are the official language and political regulations. Some world known musicians and sportsmen are coming from the island. The article presents some changes in Bovško, the mountainous landscape in the northwestern Slovenia, in the last two hundred years. It is mainly based upon the analysis of Josephinian military map from the second half of the 18th century, Franciscan cadastral register from the first half of the 19th century, present maps and field work. The author took an inventory of plant formations in Maribor according to the Braun – Blanquet method. Biotopes, characteristic of the town, were inventoried. All together 112 plant species, belonging to the 37 families. were defined. The most successful species are generalists and they are not bound to the particular type of the habitat. Regarding their origin those, which survive the habitat conditions due to their adaptability, prevail. Categories of green areas have ecological, formal and social aspect. Existing vegetation should be protected and preserved along with the development of the town. Scientific development and technological progress caused structural changes in the economy, particularly disindustrialization and transition from the secondary production to the tertiary one as well as the formation of the global market. The investments into researches and development are of primary importance for the economic development of the region and for the process of globalization. Algarve – the European "End of the World"
Due to the mass tourism Portuguese landscape Algarve is one of those European landscapes which have gone under considerable changes after the second World War. Tourists are attracted by its history, wonderful sandy beaches below the immense cliffs and its original culinary art. Country in the west, as Algarve was named by Moor's conquerors, is therefore becoming one of the most developed tourist regions in Europe. Unfortunately, Algarve was not able to avoid the same mistakes which their Spanish neighbours have done. In 1997 the British return of Hong Kong to the People's Republic of China echoed in media. At midnight of 19 December 1999 Portugal yielded Macau, Hong Kong neighbouring territory, to China. This last overseas Portuguese territory can not be compared with Hong Kong neither by the economy power nor by the number of inhabitants or the area. Despite that this is an important change on the world's political map. The article therefore presents the main geographical characteristics of Macau which can only be explained by its historical development. The first part of the article presents the theory of acid rain and its consequences. Its second part deals with the consequences of acid rain for the landscape of the landscape park Śnieżnik in Poland as seen by the author during his visit to Poland in the summer of 1999. Nitrate pollution is one of the most urgent problems considering the pollution of Slovene underground waters among which the underground waters of the north-eastern Slovenia are particularly polluted. From the establishment of the nitrogen surplus in the environment we can indirectly infer to the nitrate pollution of the underground waters. Analyses of the water quality also prove it. As one of the most intensive agricultural areas in Slovenia, Spodnja Savinjska dolina, with its specialised agriculture and stockbreeding, belongs to the regions that, considering the input of nitrogen and its surpluses, are reaching the level of western European countries. All this is also reflected in the quality of underground water. The reason for this article was a recent opening of a renovated Pocar's home which is a pearl of a folk architecture in Zgornja Radovna. Public institution Triglav National Park bought it a few years ago. With a great effort Institute of natural and cultural heritage conservation from Kranj renovated and equipped this cultural monument which represents a document of a building heritage of past centuries. The author presents Ostrava region in the Northeast of Czech Republic. Black coal-mining and metallurgy, causing different negative impacts on environment, are characteristic for this region. The phenomenon of the sinks is one of the most problematic. They remain dry in the hilly relief while they are watered by underground water in valleys and flat lands. Due to the relief changing a constant transferring and repairing of infrastructure is necessary. Many buildings also dilapidate. A dominant form of anthropological relief presents very noticeable tailing dumps. At the dawn of the 21st century the knowledge on the number and the settling pattern of the American Indians in the USA is still very vague. The following reasons can be named: the census procedures and definitions of race and ethnicity, the interests of the state and their institutions, the interests of Indian tribes and their members and the late race awareness among Indians of North America. Researchers working with statistical material must be aware of that. The article presents Dominican Republic, a small country on a tropical island Hispaniola, which is one of the most popular tourist destinations on Caribbean Islands. Apart from the warm climate and the sea and sandy beaches, tourists are also attracted by its colourful hinterland and interesting life of local people. The article deals with the population structure of Toronto, the capital of Canadian province Ontario, for which the intensive immigration is characteristic. It also presents the recent administrative changes, short economical description and some city attractions. The article presents a direct connection between a quick growing consumption of beef in Western industrialised countries and extensive deforestation of tropical rainforest in Central America, with the aim to gain a big pasture grounds for export-orientated cattle farming. The increase of the so called fast food restaurants in the Western world has had an important role in this process. Why a joint forest goes up only to the certain height above sea level? Why higher only trees and dwarf pine grow or a tree-line is so rigorous that there is no vegetation of the forests any more? The author states different types of tree-line with regard to the reasons for the abortive growth of forest in the river basin of Martuljek and Beli potok in the mountainous region in the northern rim of Julian Alps. The article deals with the problems of a newly established border region on the border of Slovenia and Croatia. The authors present the situation in this area where they investigated the inhabitants' opinion of different topics connected with the life inside the border region. They also compare this region and the border regions which have had a similar status for a longer period. The article represents the map of the former Austrian provinces in the present territory of Slovenia, which are more vivid in consciousness of average Slovene than regions, achieved by geographic regionalization. The article presents the lonely hilly farms as the most typical form of the settlement in the Slovene hilly land. On the basis of information, gathered with inquiry on the part of Slovenj Gradec Pohorje, the author established, which are the elements connected with farm economies, that shapes the form of cultural mountainous landscape. The article presents some characteristics of the Himba tribe living in Kaokoveldu in north west Namibia and some author's feelings from the visit to these African semi-nomadic pastoralists. The article brings the author's perception of the island Bali, its inhabitants and their relation to life, close link-up with the natural environment, which inspired their creativity for ages, and of their spiritual extensiveness. The article deals with some possibilities of using mathematical knowledge and photographs at the geography lessons in high schools. The article shows some interesting characteristics of the Danish relief the geography teachers explored during their excursion last spring. One of the goals of the trip was also establishing contacts with the Danish schools and geography teachers, which is already resulting in the student exchange. There is a corrosion plain situated above the Kolpa River Valley southeastern from Kočevje. This area is called Poljane or Poljanska Valley (Poljanska dolina) by the locals. It boasts a unique history, including a long period of emigration. Not many Slovenians are acquainted with natural beauties of this area and they only know Poljanska Valley (Poljanska dolina), the Poljanska Sora River Valley on the western side of Polhograjsko hribovje. International and Slovene soil nomenclature, soil group classification and using of not uniform soil terms in some Slovene geographic textbooks have been presented. The article is a summary of an extensive research project which comprehends a detailed description of the establishment of National Parks in Thailand and their importance in preserving intact nature. Radensko polje, the south eastern part of the Grosuplje basin, is an excellent example of a well developed karst polje with all characteristics: the flat floor in Quaternary sediments, enclosed by steeply rising marginal slopes of limestone and dolomite, overflowing water that emerges at springs on one side and escapes down stream-sinks (ponors) on the other side. Rich karst phenomena and higrophile vegetation caused the initiative for the procedure for establishing the Radensko polje as a landscape park protection category. The article discusses the mountain climate in The Julian Alps, Kamnik and Savinja Alps and Karavanke. Some aspects of climatic elements: sun radiation, temperatures, precipitation and wind conditions are thoroughly described. In the article the author analyses the situation of the regional geography in primary and secondary schools and on the academic level. In the primary school the main stress is laid on the global knowledge of the continents to which a problem solving approach is added in the secondary school. On the academic level an absorbed study of regional geography, based on regions (small wholes) from which a particular continent consists of, should be offered to the geography students. In spite of its small territory, Israel is a very interesting country. Apart from its long and distinctive history, unique ethnic and religious structure and in stable political situation, Israel is also interesting due to the natural and geographical features which form its surface. Some denuded caves of the Karst between Povirje and Škocjan and their speleological and geomorphological significance are represented in the article. There are features of sinter, fluvial non-carbonate deposits and landforms, the remnants of denuded caves. The knowledge of this features offers new possibilities of development explanations of the karst terrain and the origin of soils there. Šutna is a mediaeval street in Kamnik. Its renovation began when the new pavement was built and it was closed for the traffic. The main aim of the research work was to find out how the closing and reconstruction influenced the trade conditions in the street and its vicinity. We were interested in the opinion of the consumers as well as of the residents. Our aim was also to discover the structure of the customers and the structure of the trade depending on the ownership and on the activities of each individual shop or quest house. Some have called it Shangri-La; long-sought paradise, others an enchanted land of golden monasteries, but everybody considers the barren high plateau, bounded by the snow-capped mountains, for remote land of mystery that faces quick changes in last decades. The newest typization and regionalization of Slovenia, based on uniform criteria simplicity, clearness, systematics, understandability and consistent hierarchy, are presented in the article. Slovenia has been divided into 4 macroregions, 9 submacroregions and 49 mezoregions. Almost seven years has gone by since Slovenia declared itself independent. Even though we are still quite unrecognisable. Our country is also often mistaken for Slovakia. There is a degree of resemblance between these two countries. But some reasons for our unrecognizability have appeared by fault of ours, too. Mistakes has been made especially by selection of abbreviations for our country. A short history of both country names is presented and their comparison in different European languages is carried out. This way precedence of code SVN over SLO is demonstrated. The country on the Africa's east coast is due to its picturesque landscape and numerous animal and plant species one of the best visited in Africa. This article represents its historical development and basic geographical characteristics, particularity of flora and fauna and two of its 52 national parks. The Eastern Alps, as well as their southern and northern surroundings, are very suitable destination for educational excursions, either for students or for teachers. Two excursions with their advantages and disadvantages have been discussed in the article. Extremely intensive diary farming has been developed in Gorenjske Dobrave in the last decades. It has all the features of an industrial production. Although a great impact on the environment would be expected due to large energy inputs, soil and water analyses have not proved any pollution. 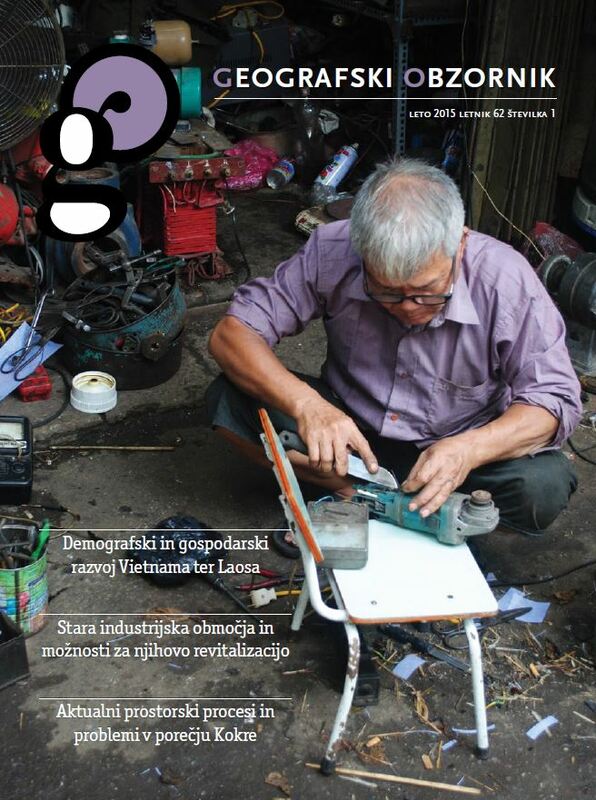 The article presents the study cases of 3 villages: Goriče, Letenice and Srednja vas. The damages done by the weather yearly represent a considerable burden on the national income and consequently an expensive impediment to the development of both the region and the country. In this treatise the causes as well as the consequences of the floods which damaged the upper parts of the Selška valley on September 9, 1995 are presented. Mekong river delta on the southern part of Vietnam is country's rice basket. Due to its economical importance it creates the fortune for the whole country. The south-east Asia's giant river dictates the development pace of the province, which is one of the biggest rice growing regions in the world. The Rhine Rift valley shape is the result of the rifting which begins some 60 million years ago. It is known as a hot spot due to the eruption of the hot mantle into the crust, which caused the crust uplift and the mantle overflow with the development of the Black Forest, the Vosges and the Rhine Rift valley. The region discussed is the most important European traffic corridor with a has great economic potential. Earth's surface lowers to -393,6 m in the Death Sea: Its water level indicates the lowest point on the Earth's surface. Death Valley in the USA with -86 m represents Earth's second lowest place. It is characteristic for both lowest points that they are formed in interesting tectonic situations. On strike-slip fault in the Death Sea there is left movement and in the Death Valley there is destrial movement present. Tectonic activities are still alive in both examples. The article deals with the make out of some teaching aids for topics, closely linked with geology, geomorphology and cartography. The article deals with some geological and karst features of the western Cuba. World famous tropical karst is described where not only karst caves and cave systems are found but also typical cone hills, called "mogotes". The processes in and on carbonate rocks in the countries near equator entirely differ from the processes in moderate zones of the classical Karst. Inspite of highly important strategic position and visible historic role these volcanic islands are relatively little known to the public. There is an absolute lack of serious geographical literature. With their natural circumstances they are hybrid like between Canary islands and Ireland. Their emerald green colour originate from abundant pastures. Oceanic climate is on the border of subtropical and temperate climatic zone. In this article, some basic energy values of sun radiation and facts about its use are represented. The trends of settlement in Slovenia are mainly disadvantageous from the point of view of the sun energy use. There are possibilities to use this important alternative source of energy to a larger extent than it is used at present. Slivnica accumulation lake lies SE from Šentjur near Celje in Ločnica valley. The lake is full of immersed and floating vegetation and it covers the surface of 84 ha. It was classified as an eutrophic lake and it is very important also for flora and fauna, especially for birds, amphibians and reptiles. Due to its exceptional function and natural value, the lake and its vicinity should be protected, probably as a landscape park. Iceland is rich in natural sights, including active volcanoes, extensive lava fields, hot springs, geysers, glaciers and snow covered summits. In the country there are extensive tundra areas and exceptionally few animal species. Natural caracteristics are rather unpleasant for human settlement, that is why less than 300.000 people live on the island. The rainforest of northern Thailand is inhabited by hill tribes. They count up to 20 groups of which there are six main ones. They have come to Thailand from Myanmar, Laos, China and Tibet. They lived primitive life, isolated from the other inhabitants of Thailand before 70s. Later on, tourists discovered their rich culture which today faces intensive erosion. Mean annual temperatures in the towns are higher than in their surroundings in Klagenfurt (1851-1900) and Celje (1881-1900) for 0.7oC, in Ljubljana (1931-1960) and Maribor (1961-1990) for 0.5oC (the minimal temperatures for 1.1oC). The town Vrhnika is warmer considering the mean annual temperatures for 0.5oC (the minimal temperatures 1.3oC), bigger town Ljubljana for 1.1oC (the minimal temperatures 1.8oC) compared to data of intermediate neighbour meteorological station Lipe. The differences are proven also inside the towns. Organisation and realisation of terrain work follow several steps. Each terrain work, individual and group, should be prepared in advance in a classroom. The collection of different stones is followed by arranging them and choosing the examples for the collection, which is the final aim of the project.